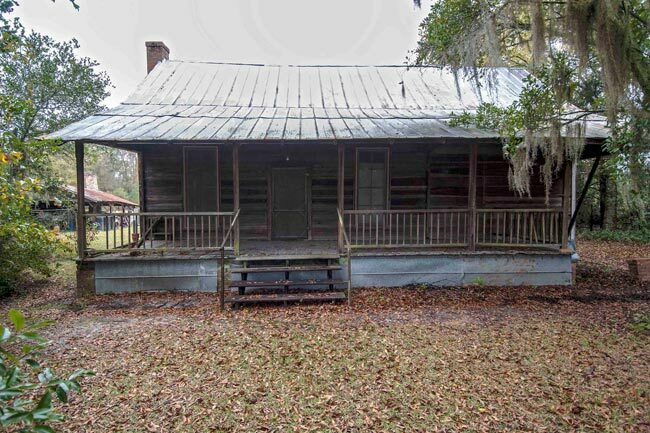 This simple farmhouse in the Bamberg County community of Ehrhardt likely was built around 1795 with hewn logs joined by dovetails. The home belonged to Dutch immigrant Jacob Copeland, who established a small farm here and produced crops such as wheat and potatoes and raised livestock. Prior to the development of the railroad, this rural town in what was then Barnwell County served as a stop along the stagecoach route that traveled the Charleston-to-Augusta Road. Small farms such as Copeland’s were successful due to the traffic from the stagecoach route. By the early nineteenth century, two new rooms had been built on the north and southwest sides of the farmhouse, and by the mid nineteenth century, the front porch was added. Jacob Copeland’s grandson, also named Jacob, was a Confederate veteran who lost a leg while serving in the Civil War. He returned here in 1864 and managed the farm that his mother, Eve, had maintained after inheriting it from her father. The younger Jacob Copeland also worked as a teacher upon his return from the war. The farm later was left to Jacob’s son George, who lived here until the 1980s. The Copeland House is significant as an excellent example of a vernacular farm residence built ca. 1795 and for its association with the Copeland Family of Barnwell County (after 1897 Bamberg County), which occupied the house and farmed the property for over one hundred and fifty years. The original core of the Copeland House is a one-story, three-bay, gable roofed log structure with no exterior embellishment. The logs are joined with full dovetails. Two rooms were added in the early nineteenth century, and a porch was added to the east façade in the mid-nineteenth century. Another building campaign in 1907 included a three room, thirty-six foot by fifteen-foot wing and a forty-foot by seven-foot porch attached to the west elevation. The property also includes a frame smokehouse and cane mill shelter that serve as intact examples of late-nineteenth and early-twentieth century agricultural buildings. Additionally there is a family cemetery and adjacent slave cemetery on the property. The Copeland house was used as a family residence from the time of its construction until the mid-1980s when Copeland family descendants sold the property. The SC Historical Society has a new acquisition, Charleston Stage Daybook, 1830-1833. The bound volume lists passengers, fares, and freight on the stagecoach that ran from Augusta to Charleston. Was the Copeland House one of the stagecoach stops?